RT! @caitlyyynnn: RT @janieloves_: Happy Birthdayyyy @Guidry_62 ! Have a Great day! Ahh! @AFletch_22 Finally has twitter! Guess who got Emoji !!!! Guess I woke up on the right side of the bed today. On the way to Edinburgh to shoot with @HCPhotography it's been too long! 08 Nov 11 copy & paste +upvote -downvote On the way to Edinburgh to shoot with @HCPhotography  it's been too long! RT @TheRealJMills: @IAmBrittanyLyn @Kristen_Lynet @dianamichele....Our pics look soo good!!! Love it! Great times!! Loved "TheExperience"
I guess it's probably something to do with @ollyofficial & maybe the Xfactor ?? Something like that? 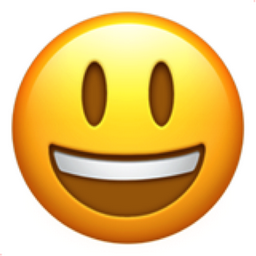 Like Smiling Face with Open Mouth Chronological Emojitweets 51?